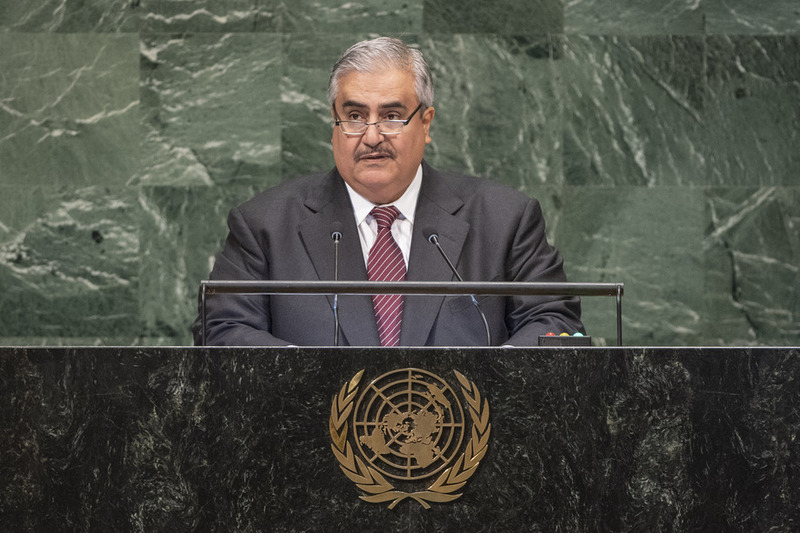 SHAIKH KHALID BIN AHMED AL-KHALIFA, Minister for Foreign Affairs of Bahrain, said his country, keen to implement programmes, plans to keep up with international efforts to achieve the Sustainable Development Goals and raise the standards of living for its citizens. His country has succeeded in mitigating the impact of economic challenges, allowing it to become one of the fastest‑growing economies in the region. Further, Bahrain’s election to the Committee on Non‑Governmental Organizations for 2019‑2022 reflects international appreciation for its policies that consolidate rights and liberties and contribute to the advancement of the objectives and purposes of the United Nations. In addition, his country has put forward its candidacy to become a member of the Human Rights Council for 2019‑2021. Achieving lasting peace, security and sustainable development in the countries of his region is a collective responsibility, he stressed. However, the Iranian regime aspires to impose its hegemony on the region by “packaging and exporting its miserable revolution under which the Iranian people suffer from tyranny, oppression and injustice”, he stated. The extremist ideology it disseminates is threatening the ambitions and aspirations of people who have coexisted for many centuries. In addition, at a time where it is imperative to establish common mechanisms for collective security, Qatar is another impediment threatening security and stability in the region through its dangerous tendency to spread and feed terrorism. He expressed hope that it will respond to the conditions put forth by Bahrain, Saudi Arabia, United Arab Emirates and Egypt — conditions consistent with international law, and the principles of good neighbourliness, mutual respect, and respect for the sovereignty and independence of States. He welcomed the United States’ efforts in that regard, notably their cooperation to create the Middle East Strategic Alliance and their strategy vis‑à‑vis the Iranian regime. Iran must end its occupation of the United Arab Emirates islands of Greater Tunb, Lesser Tunb and Abu Musa and must seriously respond to the Emiratis’ efforts to restore their sovereignty on their territory. Iran should also seek resolution of this issue through the International Court of Justice. Regarding the situation in Palestine, he said “Jerusalem must remain, as it has always been, the historic symbol of coexistence and harmony among religions”, emphasizing the importance of the commitment not to alter the legal status of East Jerusalem. The international community must act to put an end to all Israeli measures concerning the inhabitants of Jerusalem, sacred sites, and places of worship. He expressed hope that Iraq will resume its leading role in its Arab, regional and international environment. It is necessary that regional interference in Iraqi internal affairs, particularly that of Iran, come to an end. He reiterated support for all efforts towards the reconstruction of the State and the unification of the military in Libya. This would enable the army to protect the country and confront terrorism while preserving its unity and territorial integrity. In addition, he stressed that his country stands by Morocco against the flagrant Iranian plotting and interference in its internal affairs. It also supports Morocco’s serious and credible efforts to reach a solution regarding the Moroccan Sahara, based on the Moroccan initiative of autonomy and relevant Security Council resolutions, he added. The representative of Bahrain, responding to Qatar’s statement, said Qatar continues to finance and support terrorist groups, destabilizing several countries in the region. In fact, evidence demonstrates Qatar’s involvement in interfering with his country’s affairs. Having coordinated with other countries to constrain Qatar and force it to respect its commitments and end its support for terrorists in the Gulf and the Middle East, he said Qatar must stop interfering with the affairs of other States and engage in dialogue with the concerned countries.